As an important bonus, I will propose a way to do it with minimal loss of parking and disruption to drivers. The orange lines are off-street multi-use trails, and the yellow line is an on-street painted bike lane route that was installed a couple of years ago. I think it's quite amazing that the area has such high bike ridership with virtually no dedicated infrastructure. The planned 83rd Street bike boulevard (shown in green) will make things better. The concept above would offer the tens of thousandes of residents of Strathcona Centre and the surrounding areas a rich, inviting, safe environment in which to ride their bikes. It offers multiple connections to the Farmers' Market, the University, Whyte Avenue, and the shopping district anchored by Save-On Foods on Calgary Trail. In short, it represents a critical mass of bicycle infrastructure, one that provides so many inviting options that it entices many, many people onto their bikes and transforms a neighbourhood, and with it a city. Virtually everyone who moves to Copenhagen or Amsterdam gets a bike and rides it. Why? Because there is an awesome bike route steps from their house. Our strategy for our bicycle network rollout should be to "Amsterdam" one neighbourhood at a time, and we should start with Strathcona Centre Community. Over the next couple of weeks I will write about each piece of my proposal to Amsterdam Strathcona Centre. While the monetary cost would not be insignificant, the political cost would be minimal because the changes would only minimally impact parking, and they would occur in a neighbourhood that will welcome them with open arms. Copenhagen (Denmark) and Amsterdam (Netherlands) achieved their high level of bicycle use and infrastructure over a long period of time and by some very long term visionaries (citizens and government). We are VERY far behind. To get anything developed here we need to do so on a little faster pace. The 'political will' needs to be there for Edmonton to move into the direction of developing good quality bicycle infrastructure and road way user education. 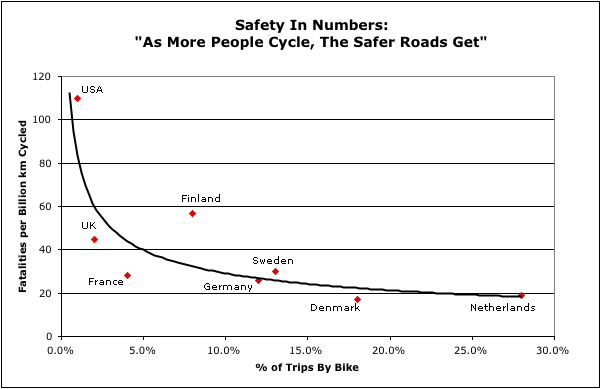 More cyclists in the transportation matrix the safer we all are. Good blog Conrad. I can't wait until you return to Edmonton with the experience you and your family had in Europe and use that awareness and passion to improve Edmonton's bicycling infrastructure.